Prairie View picks up two awards this week. 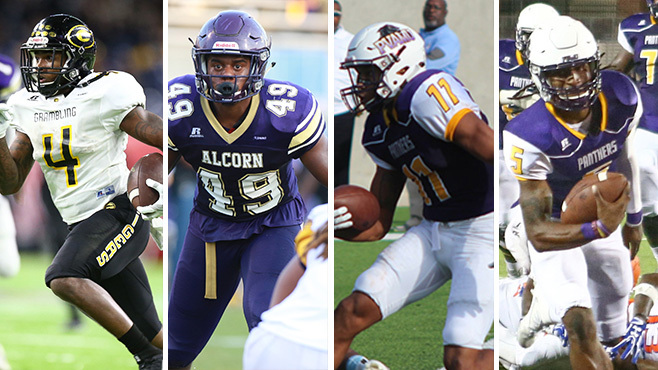 BIRMINGHAM, Ala. – Grambling State senior running back Martez Carter, Alcorn State sophomore linebacker Solomon Muhammad, and Prairie View A&M redshirt senior Darius Floyd and redshirt junior Lavell McCullers and were all named the Southwestern Athletic Conference Football Players of the Week in week two of the season for their outstanding play. For the second straight week, Muhammad stood out for the Alcorn defense. He registered nine tackles, four tackles for a loss, two sacks and a pass break-up in Friday’s 17-10 defeat against FIU at Legion Field. One of his sacks resulted in a second and 35 for the Panthers. Muhammad’s performance came after he tallied a career- high 10 tackles in the season opener. (85) against the Bearkats. Of his returns, four were 20 plus yards with all four of those returns leading to Panthers touchdown drives. Floyd also rushed two times for 20 yards and caught two passes for 12 yards. In his first start in a PVAMU uniform, the redshirt junior had 280 total yards and led the Panthers on four scoring drives in a 44-31 defeat against FCS #3 ranked Sam Houston State, three of which were touchdown drives. McCullers also rushed 14 times for 126 yards and one touchdown (one-yard run) and completed 16-of -30 passes for 154 yards.